Co-Authored by: Vee Cecil and The Arc. Vee is a Wellness Coach, Personal Trainer, and Boot camp Instructor who lives in Kentucky with her family. Vee is passionate about studying and sharing her findings in wellness through her recently-launched website. Summer is officially in full swing. And for many, that means spending more time outside on sunny days or trips to local pools or beaches. Swimming is a great way to fill up those summer days for many reasons. It is an excellent form of exercise and it has also been shown to have mental health benefits. That said, any time individuals with intellectual and developmental disabilities (I/DD) are around water, extra precaution should be taken. The National Autism Association pegs drowning as one of the leading causes of death among children with autism, and as Prevention1st.org notes, children with developmental disabilities are twice as likely to suffer an unintentional injury. One factor that further endangers individuals with autism and other intellectual disabilities is that they may not immediately understand the dangers of water. Especially in the case of children with autism, they may even be drawn to it or fascinated by it. This is why it is so important that parents, caregivers, and individuals with I/DD and autism understand water safety practices. 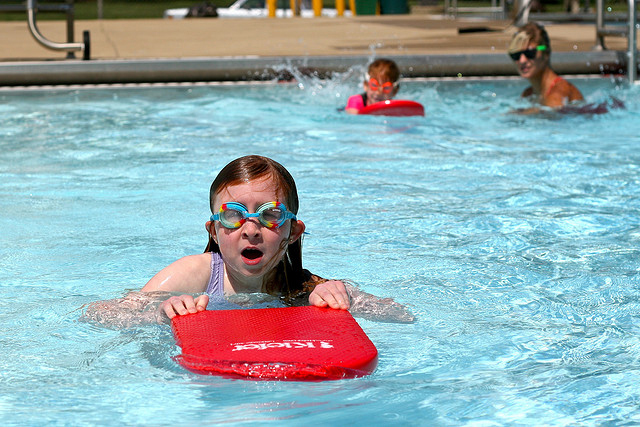 Adaptive swim lessons are given through the YMCA at various locations throughout the US. Click here to see a list of locations. CDC’s recent issues of Vital Signs stated that the rates of melanoma, the most deadly form of skin cancer, have doubled over the last 3 decades. Applying (and remembering to reapply) sunscreen when outdoors, after getting out of the water, and especially during peak sun hours will help to prevent sunburn and furthermore skin cancer. Sunscreen should be at least an SPF of 15 and applied on sunny as well as cloudy days. If any of these symptoms are present, an individual should get out of the sun immediately and head indoors or to a shady spot. If available, a cool wet washcloth should be applied to their skin to help bring down their body temperature. To help prevent overheating make sure to drink plenty of water before, during, and after spending time outside. When planning outdoor events, keep in mind that the sun is at its hottest between 10am and 4pm, so having spots where individuals can go inside to cool down or seek some shade is vital. Making sure those you care for are well informed about how to stay safe in the sun and near water this summer is essential. The Arc’s HealthMeet project has developed Water Safety, Sun Safety, and Heat Sickness flyers to post in and around your organization to help teach and reinforce these important lessons. This entry was posted in Programs and Supports and tagged HealthMeet. Bookmark the permalink. This person is a guest blogger for The Arc.